We are fortunate in this great country of ours to have an abundance of basic produce available year-round. We can find tomatoes, citrus, apples and other fruits, as well as a variety of greens and other vegetables at local grocery stores whenever we want. But there is something to be said about eating vegetables and other produce when they are in season. 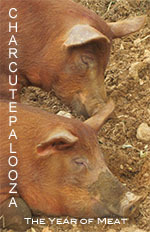 They arguably taste best that way and they definitely are less expensive during the peak of their seasons. Although generally available throughout the year, the prime time for acorn squash is fall and winter. We’re all for eating seasonal (and local) food where possible, and wanted to find an acorn squash recipe that we really like for the colder months. We tried this one, but thought it was a little too sweet for our taste, especially since acorn squash tastes pretty sweet on its own. 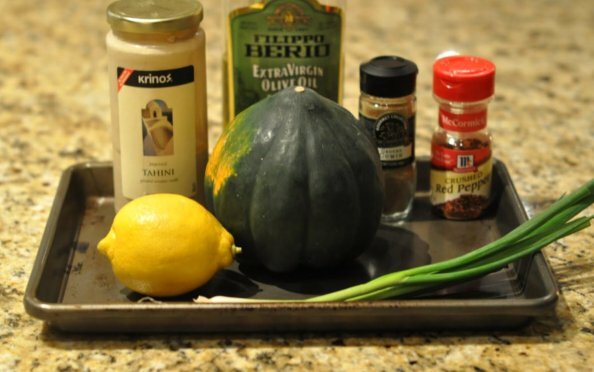 For our next acorn squash experiment, we adapted this recipe, which incorporates a bit more spice, and adds a little Mediterranean flair, while complementing the inherent sweetness of the squash. And just like that, we have a new favorite side dish. This acorn squash is easy to make — roast it while basting with a combination of olive oil, cumin, garlic and green onions, then finish with red pepper flakes and a sauce made with lemon juice, tahini and olive oil — and it’s fun to serve as a savory and filling side complete with its own, homegrown, bowl. Start by cutting the squash in half, lengthwise. The skin of the squash is pretty tough, so use a large, very sharp knife. You may want to make smaller cuts in the skin of the squash along the line where you plan to cut it in half, in order to make it a little easier to cut through the tough part. Scoop out the seeds from the middle of each half and discard. Make some cuts in the flesh of the squash in a grid pattern, without cutting all the way through to the skin. This will allow the sauce to sink into the squash better when you baste it. Combine olive oil and cumin and brush it on the squash. Season the squash with salt and pepper. Line a cookie sheet with foil (to catch drippings and preserve your cookie sheet) and place each squash half on the cookie sheet, cut-side-up. Since the outer skin of the squash is not flat, the halves may not sit level very well. It helps to make foil rings and sit the squash halves on top of the rings to hold the squash in place, especially for basting purposes. Place the squash in the oven preheated to 425 and roast for about 15 minutes. While the squash cooks for the first 15 minutes, combine more cumin and olive oil with minced garlic and chopped green onion (white parts only — reserve the green parts for garnish) for basting the squash. After the squash has cooked for about 15 minutes, take it out of the oven and brush the olive oil mixture all over each half. The basting mixture tends to collect in the bottom of the squash half, so keep brushing it up along the sides and top edges to coat the squash as evenly as you can. Place the squash back in the oven and continue cooking, basting about every 10 minutes, until the squash is tender and browned along the edges. Ours took about 40 minutes total to cook, but cooking time will vary depending on your oven and the size of the squash. While the squash cooks, whisk together lemon juice, tahini and water in a small bowl. Slowly add the olive oil while whisking constantly. Season the tahini sauce to taste with salt and pepper. When the squash is done, brush it with the lemon-tahini mixture and sprinkle a dash of red pepper flakes on each half. Save the extra tahini sauce to serve alongside the squash. Garnish with chopped green onion (green parts) and serve each half in its skin. The tender squash meat pulls away easily from the skin, and a good way to meld all the flavors is to pull the meat from the sides toward the middle, drizzle more tahini sauce over it, mix it all together, then enjoy each flavorful bite. We enjoyed our acorn squash that night with lamb london broil and tabouli for a Mediterranean Winter (oxymoron?) feast! After cutting the squash in half and removing the seeds, score the squash meat in a grid pattern to allow the sauce to sink in while basting. Combine 3 tablespoons of olive oil and 1 teaspoon of cumin in a small bowl, then brush the mixture on the squash halves. Season the squash with salt and pepper, then place the halves on a cookie sheet lined with foil. Set the squash halves on foil rings if necessary to keep them level. Place the squash in the oven to roast for about 15 minutes to start. While the squash cooks, combine the remaining ¼ teaspoon cumin with 2 tablespoons olive oil, garlic and white parts of the green onion for basting the squash. After 15 minutes, remove the squash from the oven and baste with the olive oil mixture, coating the sides and top edges as much as possible. Continue cooking the squash, basting every 10 minutes or so, until the squash is very tender and the edges are browned — about 30-40 minutes total cooking time. While the squash continues to cook, make the tahini sauce. Whisk together the lemon juice, tahini and 2 teaspoons of water in a small bowl. Slowly add the remaining 1 ½ tablespoons olive oil while whisking constantly. Taste and season with salt, pepper and additional lemon juice or olive oil as needed. Serve the squash (in its skin) garnished with the tahini sauce, a dash of red pepper flakes and chopped green onion.